4 Complete saddle patterns, 2 English and 2 Western! A full size book, 8 1/2" x 11" spiral bound to lay flat while you work! Over 150 pages of information, pictures, instructions and patterns! 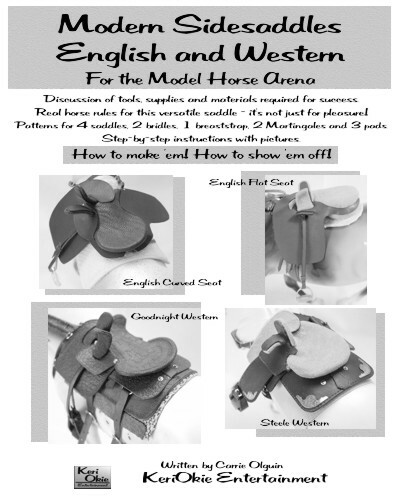 Includes instructions for a simple English snaffle bridle, Western working bridle and Western pleasure bridle! Instructions for English Martingale, Western Martingale and Western breast strap! Breakdown of the real horse rules for sidesaddles. It's not just for Pleasure Classes! "How to make 'em! How to show 'em off!"